Yet the quality and amount of feedback provided to teachers is disappointing. A 2009 study of 12 districts found that 75% of teachers “received no specific feedback about how to improve their practice,” and only 43% actually used feedback to improve instruction. Why isn’t teacher feedback better? The short answer: Imparting meaningful feedback is difficult. To offer support, this guide surfaces key elements of effective feedback—the kind that accomplished principals, coaches, and consulting educators use to positively infuence instruction. Furthermore, it addresses these key questions. Align feedback with a teacher’s reflective capacity? Ensure that all stakeholders share the same definition of effective instruction? Use feedback language that teachers won’t resist? 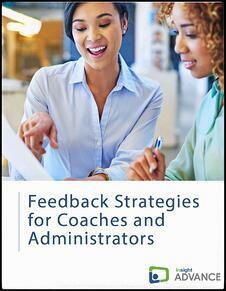 Solicit meaningful feedback from colleagues, inexperienced observers, and students? Resuscitate a school’s feedback culture when it’s institutionally comatose? Beyond answering these questions, this PDF guide introduces the reader to well-supported feedback models, protocols, and scripts. Observation Models - Explores instructional rounds, “look-fors” variations, and the Classroom Walkthrough Models Matrix. Creating a Common Teaching Vocabulary - Explores learning frameworks and indicators of exemplary practice. Popular Feedback Models - Suggests the Tuning Protocol and other peer review and coaching models. Using Language That Motivates - Explores when to switch from 1st, 2nd, and 3rd person while giving feedback. Commentary Modes - Explores warm, cool, and hard commentary. How Teachers Can Assume Agency in the Feedback/Evaluation Process - Explores how to solicit feedback when the school culture does not support it or the coach is inexperienced. Models for Using Video in the Feedback Process - Suggests “What? So What? Now What?”, the “Feedback Carousel”, and “The Best Foot Forward Project”.